So, Where Are Paddy and Plunkett This Week? We left them here last week… but what on earth is that in the background? 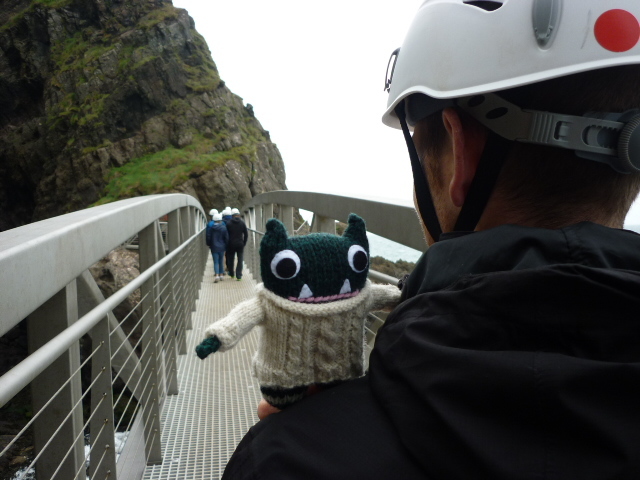 This unusal-looking bridge is part of the newly revamped and reopened Gobbins Cliff Path, which is about half an hour’s journey outside Belfast, on the County Antrim coast! The original Gobbins path opened in 1902, as the expansion of Northern Ireland’s railways helped to open up parts of the province which had been difficult to reach before. The Gobbins was a genuine old-school tourist attraction, purpose-built by the Chief Engineer of the Belfast and Northern Counties Railway Company to encourage people to visit this part of the country, and to show off the area’s spectacular coastline! However, the Depression in the 1930s and the growing popularity of cars meant that the railway company could no longer afford to maintain the system of bridges and walkways that made up the path. And when the Second World War broke out, finding people to look after The Gobbins was hardly a priority! It started to fall into disrepair, and a partial reopening of the path in the early 1950s was scuppered by a landfall shortly afterwards. The Gobbins closed in 1954, and was fully abandoned seven years later. Since then, there have been a couple of attempts to reopen the attraction, but nothing came of them… until now! Thanks to a combined effort (and some all-important funds) from the local council, the EU and the Ulster Garden Villages charity, a full restoration started in 2014… And now it’s open for business! Hey, it looks like the boys are ready to start the tour! …But not the whole way! Here’s Plunkett posing with the restored Tubular Bridge, the most distinctive part of the path. And again, at Sandy Cave. Apparently, this spot was popular with Victorian picnic parties… and smugglers! My Secret Seven-reading 8-year-old self would have loved this place! But even walking on little short Beastie legs, the tour was over all too soon… Time to get the train home, lads! We’ll see Paddy and Plunkett again soon, I’m sure… And if you’re in the neighbourhood, why not take a trip to The Gobbins yourself? You can find out more about booking here. Next Post Love is in the Air… Again! Have a lovely weekend, Helen. Heehee, thanks! I’m normally notified of changes in Beastie cuteness levels… Looks like a full scientific investigation might be in order 😀 And I’m guessing the weekend is already well under way where you are, so enjoy! Hmmm, scientific, lol; no need. Yes, weekend already here. Have a lovely one yourself, Helen. Saw loads of adverts for this place when we were in Ireland over the summer, great to see what it is like. Looks amazing, something to try out next time…..
Good to know, thank you for the tip!! We will definitely be planning that one in for next summer! !